A message from CAMA President Arthur Gaudi in a 1971|72 Annual Report gives “special mention to the Los Angeles Philharmonic and [music director] Zubin Mehta” as “the mainstay of our seasons.” Indeed, from 1970 to 1979 the Los Angeles Philharmonic visited Santa Barbara 47 times, six times in the 1975|76 season alone! In 1971, with Pat Manchester as Women’s Board President and future Women’s Board President (1972–1974) and CAMA President (1980–1984) Carolyn Panosian as benefits chairman, the Women’s Board booked the Burt Bacharach/Neil Simon Broadway hit Promises, Promises for two performances at the Granada Theatre. 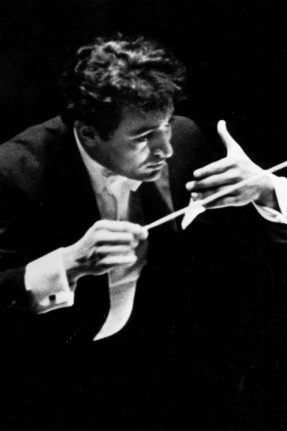 The main CAMA Board booked the Los Angeles Philharmonic in a pops concert with Arthur Fiedler at the Earl Warren Showgrounds in September 1977 and Women’s Board President (1976–1978) Christine Seemann helped to sell the attraction to the public. The Women’s Board Fashion Shows continued with the annual sponsorship of Saks Fifth Avenue. Bus trips also continued through the 1970s and 1980s. Notable concerts from the 1970s included performances by the Concertgebouw Orchestra with Bernard Haitink, the London Philharmonic with Erich Leinsdorf, the Cleveland Orchestra (twice) with Walter Susskind and Lorin Maazel, the Royal Philharmonic Orchestra with Lawrence Foster, the Philadelphia Orchestra with Eugene Ormandy, and the Rotterdam Philharmonic with Edo de Waart; recitals by Isaac Stern and Philippe Entremont; and appearances with orchestra by pianists Misha Dichter, Jerome Lowenthal, Jens Harald Bratlie, and Garrick Ohlsson, soprano Gundula Janowitz, and violinists Yehudi Menuhin and Pinchas Zukerman.